Electrical Services | AAA Quality Services, Inc.
Signs & Neon: A well lit sign is extremely important to a business. We can service your sign to ensure it is working properly, change light bulbs and ballasts as necessary. Neon? 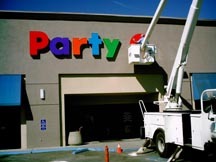 Not a problem, AAA Quality Services can troubleshoot and repair neon signs. Did you know a blinking light bulb may be caused by something more serious? If a bulb is not supposed to blink and it is, turn it off and change the bulbs. Allowing bulbs to blink can burn out a ballast, a much costlier repair. Whether it is a free standing sign, wall mounted or a monument sign, we can help keep you lit up. 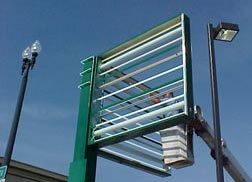 Security Lighting: Parking lot lights are also extremely important to business. We have a variety of low sodium and metal hallide bulbs in stock. 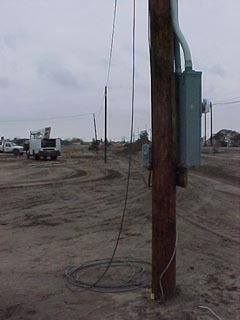 Construction Site Services: AAA Quality Services can provide meter service for temporary office trailers, temporary power installation and rent of meter poles and recepticle poles. We also have transformers and spider boxes for rental. Electrical Maintenance: You would like an extra recepticle or add a ceiling fan - or you have an outlet that is not working; AAA Quality Services has trained electricians with experience handle all your electrical concerns. We are experienced in both commercial and residential applications.